Axel, K., M. Di-Bernardo, and R. Maneyro. 2006. First record of Chaunus achavali (Anura, Bufonidae) from Rio Grande de Sul, Brazil, with a key for the identification of the species within the Chaunus marinus group. Iheringia Serie Zoologia 96(4):479-485. Beebee, T.J.C. 1996. Ecology and conservation of amphibians. Chapan & Hill, London, United Kingdom. Behler, J.L., and D.A. Behler. 2005. Frogs, a Chorus of Colors. Sterling Publishing Co. Inc, New York, New York, USA. Beltz, E. 2005. Frogs, inside their remarkable world. Firefly Books, Buffalo New York, USA. Bowcock, H., G.P. Brown, and R. Shine. 2008. Sexual communication in cane toads, Chaunus marinus: what cues influence duration of amplexus? Animal Behaviour, 75:1571-1579. Chaparro, J.C., J.B. Pramuk, and A.G. Gluesenkamp. 2007. A new species of arboreal Rhinella (Anura: Bufonidae) from a cloud forest of southeastern Peru. Herpetologica. 63(2):203-212. Department of Environment and Conservation. Cane toads. www.canetoadbattle.com Accessed March 2, 2009. Duellman, W.E., and L. Trueb. 1986. Biology of Amphibians. McGraw-Hill Book Company, New York, New York, USA. FrogWatch Australia. <www.frogwatch.org.au/> Accessed February 28, 2009. Gleitzman, M. 1999. Toad Rage. Random House, New York, New York, USA. Hagman, M., and R. Shine. 2008. Deceptive digits: the functional significance of toe waving by cannibalistic cane toads, Chanus marinus. Animal Behaviour 75:123-131. Hofrichter, R. 2000. The encyclopedia of amphibians. Key Porter Books Limited, Toronto, Ontario, Canada. Honoluloo Zoo. Cane toad. http://www.honoluluzoo.org/cane_toad.htm Accessed March 1, 2009. Lever, C. 2001. The cane toad, the history and ecology of a successful colonist. Westbury Academic and Scientific Publishing, West Yorkshire, United Kingdom. Lewis, Mark. Cane toads: an unnatural history [videorecording (DVD)]. A First Run Features presentation written and directed by Mark Lewis; Film Australia. Narayan, E., K. Christi, C. Morley, P. Trevenen. 2008. Sexual dimrphism in the cane toad Bufo marinus: a quantitative comparison of visual inspection methods for sexing individuals. The Herpetological Journal, 18(1):63-65. Pauly, G.B., D.M. Hillis, and D.C. Cannatella. 2004. The history of a Nearctic colonization: Molecular phylogenetics and biogeography of the Nearctic toads (Bufo). Evolution 58:2517–2535. Pramuk, J.B., T. Robertson, J.W. Sites Jr, and B.P. Noonan. 2008. Around the world in 10 million years: biogeography of the nearly cosmopolitan true toads (Anura: Bufonidae). Global Ecology and Biogeography, 17:72-83. Semlitsch, R.D. 2003. Amphibian Conservation. 2003. Smithsonian Books, Washington DC, USA. Siebert, P. 1996. Toad Overload: a true tale of nature knocked off balance in Australia. The Millbrook Press, Brookfield, Connecticut, USA. Slade, R.W., and C. Moritz. 1998. Phylogeography of Bufo marinus from its natural and introduced ranges. Procedings of the Royal Society of London, 265:769-777. Somervill, B. 2008. Cane Toad: Animal Invaders. Cherry Lake Publishing, Ann Arbor, Michigan, USA. Stebbins, R.C., and N.W. Cohen. 1995. A Natural History of Amphibians. Princeton University Press, Princeton, New Jersey, USA. Urban, M.C., B.L. Phillips, D.K. Skelly, and R. Shine. 2008. At toad more traveled: the heterogeneous invasion dynamics of cane toads in Australia. The American Naturalist, E-article, 171( 3):E134-148. Wright, A.H., and A.A. Wright. 1949. Handbook of frogs and toads of the United States and Canada. Comstock Publishing Associates, Ithaca, NY USA. Zug, G.R., and P.B. Zug. 1979. 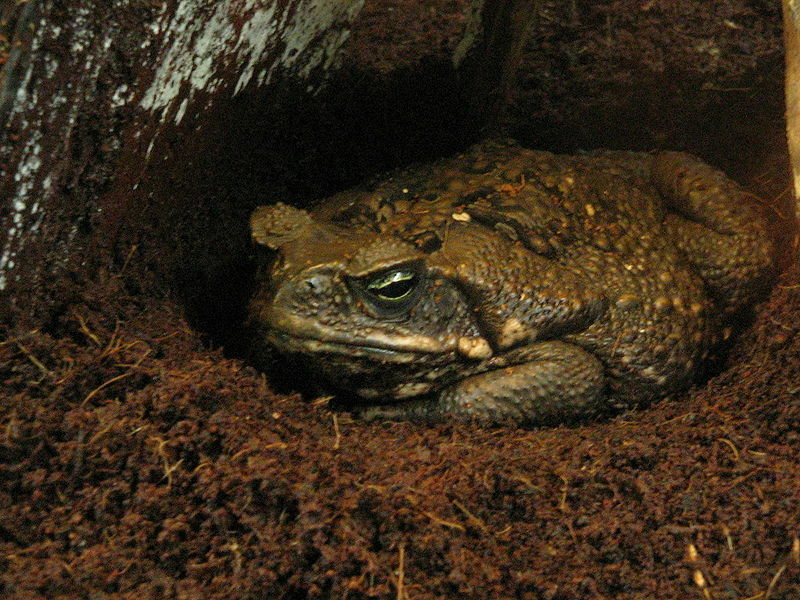 The Marine Toad, Bufo Marinus: A Natural History Resume of Native Populations. Smithsonian Institution Press, Washington DC, USA.